Topic suggestion from Krysta on our Facebook Page. 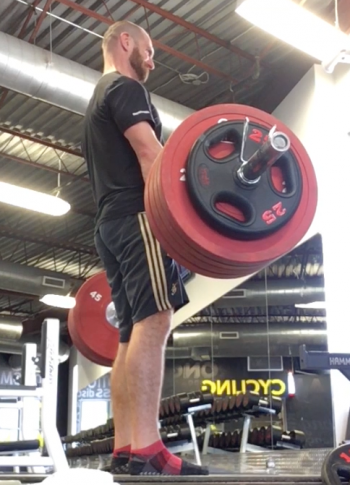 I’d love to hear about set\rep amounts and the weight of the weights for different goals such as losing weight vs building muscle … I’ve been told it’s different! Thanks for this topic Krysta, it’s been a while since I’ve covered and although my views are more or less the same as they have been for the last 10 years, there are some differences, as well, I will talk about where the confusion comes from, so that as you the educated and informed consumer are going through the information you can draw your own conclusions or decide whether or not something is relevant to you. I will start with the reps for weight loss topic because it’s the most straightforward. The fewer reps of sugar and fat you put in your mouth, the better that is for weight loss. The more reps of protein you put in your mouth the more muscle you build, to a point, and when you combine it with any kind of strength or resistance training. There’s a limit to the amount of protein your body can synthesize in a day, that gets laid down as actual muscle, which is somewhere in the range of .5g to 1g per kg of body weight, for most people that means 40 to 100g per day and it has to be combined with resistance training. This leads into what this questions really is, how much weight and how many times do I have to lift it to get the most favourable body composition possible? I was being a bit tongue in cheek earlier, but the truth is as long as you’re lifting heavy enough weight, with good enough form, enough times that your muscle gets broken down enough that it has to heal back bigger and stronger you will build muscle and have a more favourable body composition and the more on point your dietary habits are the more favourable your body composition will become. Which is the short answer for this question, but I’m feeling a bit long winded today so let’s dive into and I apologize in advance, because I have a sneaky suspicion I will run a bit long on this topic. Let’s quickly cover what ‘on point dietary habits’ are, of course different strokes for different folks, but if you follow these basic rules there’s a good chance you’re eating better than most people. On tops of that, this is how I eat and I will take my under 10% body fat to the bank any day of the week. Mostly plants – mostly in this case is in the realm of 75% to 95%, give or take. Get enough sleep, probably somewhere between 7 and 9 hours every night. Let’s assume at minimum you’re doing those 3 things, now we can talk about sets and reps. The reason there’s so much confusion surrounding the number of sets and reps of an exercise you should do and the amount of weight you should lift is because there are a lot of different goals or reasons a person might lift and there are many counterexamples of people lifting very different ways, but attaining virtually identical results, if we quickly look at bodybuilders for example, there are people who apparently only strength trained for 15 to 20 minutes per day, like Mike Mentzer who won championships and then polar opposites like Arnold Schwarzenegger who probably trained more like 2 to 4 hours a day. If you come back to you, regular Jane Doe Fit, of course you’re confused and this is even before we consider how experienced you are and what stage of program you’re in, if you’re training for something specific like a sport or an event of some kind. Which brings me to the most important point I’m going to make of this whole episode, although it can be confusing the truth is that the number of sets and reps don’t matter nearly as much as the quality of the muscle contraction, your form while exercising, those are closely related to one another, how often you take your muscles to failure and if we decide to get a bit more advanced, how often you mix up your training once your body starts to adapt. Now let’s officially get to the question, maybe the best way to do this is to define what sets and reps are, then I can get into some of the conventional wisdom of where you may want to do your training. Reps are the number of repetitions you do of an exercise and sets are the number of times you do a specific set of reps. Example- Let’s say you’re trying to get better at push-ups so you decide to do 10 reps of push-ups in a row, after you’ve completed those 10 push-ups you stand up and take a break, that’s called a set of push-ups, once you recover a bit you get back on the ground and do another 10 push-ups then stand up, now you’ve completed 2 sets of 10 repetitions of push-ups. Over the course of a workout you can technically do as many sets of as many reps of an exercise as you would like or are physically capable of doing. Conventionally speaking, you might hear something to the effect of ‘if you want to build strength do fewer reps with heavier weight this might be 3 to 5 sets of 1 to 8 reps of an exercise where you go to muscles failure for at least 2 or 3 of those sets and you take 1 minute to 3 minutes of break depending on the set, if you want to build muscle endurance do more reps with less weight, again 3 to 5 sets maybe more doing 15 to 20 or even more reps of an exercise always to failure. If you’re after hypertrophy aka increased size, then you will probably fall somewhere in-between, with the major difference being most people interested in hypertrophy will do 3-10 sets of an exercise or do 3 to 15 sets combined of different exercises focused on the same muscle group, example they might do 4 sets of squats, then 4 sets of leg press, then 4 sets of deadlifts, for 6 to 12 reps choosing a weight that takes them right to failure for 2 or 3 sets in each of those exercises. I’m going to leave power training out for now, because if you’re unsure of the number of reps you should be doing and amount of weight you should be lifting you’re not ready to train for power yet, because we focus a lot on technique and the speed of the muscle contraction, as in the muscle contraction needs to be fast and under relatively heavy load, and is not something you should attempt unless you’ve been lifting consistently for 3 to 6 months, have really good technique and are very comfortable pushing your body. That’s the basic conventional rundown of how many sets and reps you would do of an exercise to achieve the outcome you’re looking for. I know you’re probably asking, but Jonathan you didn’t mention anything about weight. How do I know how much weight to lift? That’s actually the simplest part of this whole thing, er on the side of lighter weight, then use trial and error to figure out how much you can and should lift. I’ll go through the specific considerations through this next part. If you’re first learning how to do a movement stay with high reps, which I would consider 12 to 15 reps, with low weight, where low weight is an amount you could still continue to do if you wanted once you get to 15 reps and you can start with 1 to 3 sets of an exercise, for the first two weeks this will be hard enough. Once you have the movement of an exercise down you can increase the weight to a point where 15 repetitions in a row is failure, as in you can’t do anymore, now I said 15, but you could use a weight that is heavy enough that you can only do 10 or 12 reps, as long as your form is good, what we’re looking for is your intended muscle or muscles to contract enough times under enough load or weight to breakdown and be stimulated to change and grow back stronger. Once you’re more comfortable exercising, what should you do next? Get better at the basics, If you were working with me directly, we would probably pick 5 to 8 basic exercises and focus on getting better at them by doing about 3 sets of each one for 8 to 15 reps, again I would be much more concerned about the quality of the movement and the quality of muscle contraction. Examples of basic exercises would be, Goblet or Assisted Squat, A big push like push-ups, a big pul like pull-ups or bent over row, a hinge like a RDL, some kind of overhead shoulder press or pike push-up and a total core exercise like a plank and/or side plank, and maybe a carry like farmers walk for the really adventurous. This would be just to get started, used to moving your body, building control and getting used to exercising. Once you’re consistently doing that then we can look at manipulating sets, reps, speed of muscle contractions and rest periods geared towards a specific outcome, but truthfully if all you do is lift heavy stuff up until you can’t anymore, in a variety of ways focusing on form and good high quality muscle contractions and you go to failure most of the time you will get stronger and build that favourable body composition you’re looking for provided your dietary habits are on point and you’re getting a high quality of sleep as well. As a follow-up to this episode, I would really like to hear from you about some specific questions you might have, for example, you said Mike Mentzer on exercised for 20 minutes a day and Arnold Schwarzenegger exercised for 2 to 4 hours, but they competed with one another, how is that possible? Maybe why is it that Billy Blanks of Tae Boe boxing fame is super ripped and muscular, but the other fitness models doing the apparently same exercise classes with him in the videos aren’t? I’m just riffing those off the top of my head, but if you have questions like that send them in to info@fitnessforfreedom.com I think my answers would be really helpful in helping you decide what types of exercises you want to do and how it might be helpful for you in your exercise programs.